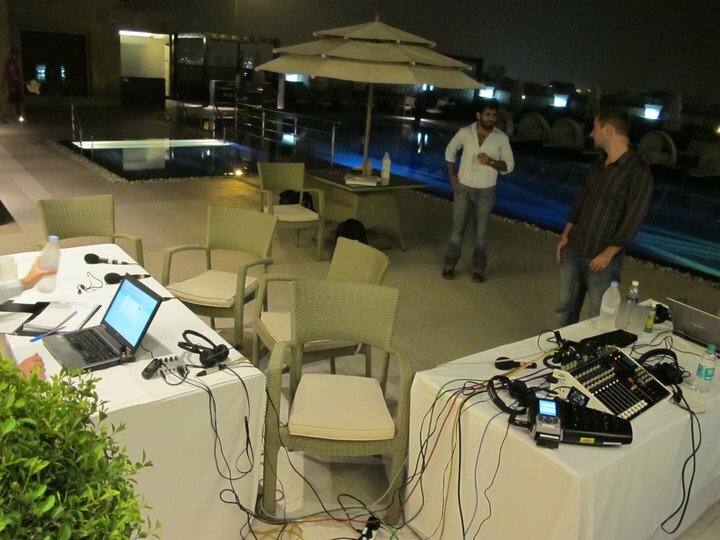 "First transmission for BBC World Service's Sports World at The Commonwealth Games, Delhi. Poolside at the Lalit. BGAN [had some technical difficulties with the ISDN service] before we went on air so we did 40 minutes on the Comrex with a Tata Photon 3G stick Worked a treat and saved the transmission!" "The Comrex ACCESS (attached to 3G) is set up as the backup here. When it works, the BGAN is OK, but we've had a few instances here of it dropping off, so 3G is the next option. We're using Comrex's to report from venues where there are no ISDN's available and they are getting the thumbs up from our reporters..."
"This is BBC World Service's Sports News reporter, Alex Capstick, reporting live from outside the JN stadium, prior to to the opening ceremony of the Commonwealth Games."